Uterine fibroids can be present, but be inapparent. However, they are clinically apparent in up to 25% of all women and cause significant morbidity (disease), including prolonged or heavy menstrual bleeding, pelvic pressure or pain, and, in rare cases, reproductive dysfunction. Both the economic cost and the effect of fibroids on the quality of life are substantial. Fibroids are not cancerous. Drugs that manipulate the levels of steroid hormones are effective in treating fibroids, but side-effects limit their long-term use. Fibroids may be removed if they cause appreciable discomfort or if they are associated with uterine bleeding. Surgery is the mainstay of fibroid treatment. 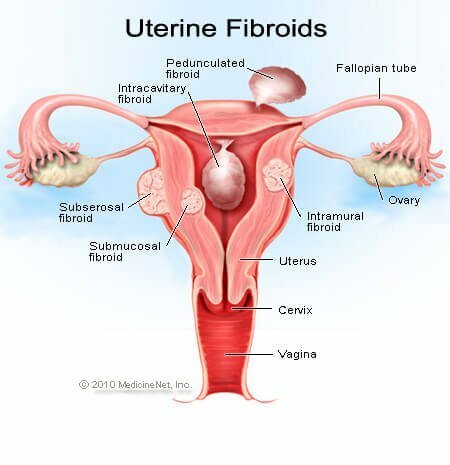 In addition to hysterectomy and abdominal myomectomy, various minimally invasive procedures have been developed to remove fibroids from the uterus. A uterine fibroid is also medically known as a leiomyoma (or simply a myoma) of the uterus.